Whether you will be first-time parents, or are looking for a new pediatrician for your family, call us to set up a no-charge visit to meet a physician and the staff. We call this visit a "pre-natal" visit (even if your child is already born or older) and we will answer questions you may have about the practice, as well as questions about what to expect once your baby is born, if you're expecting. We encourage you to contact the office which you would choose, which is generally the office closest to your home. During the first year of life, your child will be seen for check-ups 8 times before turning 12 months. So much growth and development takes place during this time, we feel it is important to monitor your baby's health frequently. During these visits, our clinical staff will take careful measurements of your baby's growth, including height, weight and head circumference. Your physician will ask you questions about developmental milestones (speech/social development, motor development, etc.) and make sure your baby is given the appropriate immunizations. Sleeping and eating patterns will be discussed. We recommend you watch a video that Dr. Sheryl Jawetz made which discusses sleep training. At the six-month visit we advise you to start giving vitamins and solid foods. Many patients have questions about when to start feeding their baby solid foods. Click here to see a video of Dr. Wisotsky teaching about this. At the nine-month visit we will test your baby's blood for anemia and lead with a small fingerstick. We prefer to do the test in-house so that we can get faster results, but if your insurance does not cover in-house blood tests you have the option of going to an outside lab. We also discuss the transitioning from baby food to table food. Check-ups continue to be a very important of your child's life in this stage. Important lab tests and screenings are performed, which are more fully explained below. At the 12- and 15-month visits, we continue to document feeding and sleeping habits. At the 12-month visit we also test for Turberculosis in addition to the appropriate immunizations. At the 18-month visit we ask that prior to your visit you complete a MCHAT questionnaire which screens for autism. We have the test in an online format which you can access by clicking here: MCHAT. The questionnaire's responses are sent to our practice where it will be scored and reviewed with you at the visit. We recommend you review the video that Dr. Larry Stiefel recorded on "Toilet Training"
This video helps guide you in a) knowing whether your child is ready to be toilet trained, and b) once your child is ready, the video also describes techniques in making the experience successful and positive for ALL concerned! Check-ups continue for age 2, 2 and a half, and then annually from age 3 - 6 with more lab tests, such as hemoglobins, urinalysis and cholesterol tests, being performed. These tests can all be done at the practice, or you can take your child to a lab as an option if your insurance does not cover in-house labs. At age 3 we recommend your child's eyesight be screened with the Pediavision. This is a tool that screens for common issues like eye muscle weakness and near sightedness, without the need for the child to read off letters or numbers. If you choose to have your child go to an ophthalmologist instead, you should take him/her by age 4. At age 3 we also test your child's hearing using a device that does not rely on your child's cooperation, but tests the eardrum objectively. At age 6, except for the flu vaccine which we recommend annually, there are no immunizations until your child turns 11. Regular lab work is performed. We recommend annual checkups throughout the pre-teen years. Immunizations are given at age 10 or 11 as well as the HPV at age 12. Labs are performed including urinalysis, hemoglobin and cholesterol. These lab tests are performed in-house or you can go to an outside lab if you choose (your insurance company may not cover in-house labs). We continue to monitor hearing and vision, growth and development and social development. Puberty is discussed during the later years of this stage, and the HPV vaccine is also discussed at age 12. The HPV vaccine protects against viruses that lead to certain cancers. Your child should continue to receive annual check-ups during their teen years. We generally see children through college but will often recommend transitioning to an internist during that time. This stage of your child's growth and development requires continued monitoring and education. Heights, weights, lab tests and hearing/vision screenings are performed and it is a time that the patient can discuss other concerns directly with their doctor. An additional Tuberculosis test is given to patients entering high school, and a meningococcal vaccine is given prior to starting college. At age 18, as your child is now a legal adult, we treat them as such, and they are given a form to authorize the sharing of medical information with their parents if they so choose. Dr. David Schaumberger is one of the pediatricians working out of our newly expanded Park Ridge office. As someone who lives nearby, he enjoys working in Northern Bergen and Rockland counties. Dr. Schaumberger completed his pediatric residency from the Mount Sinai School of Medicine in New York and has been working at Tenafly Pediatrics since 2001. On a personal note, he enjoys ethnic cuisine and spending time with his three children. 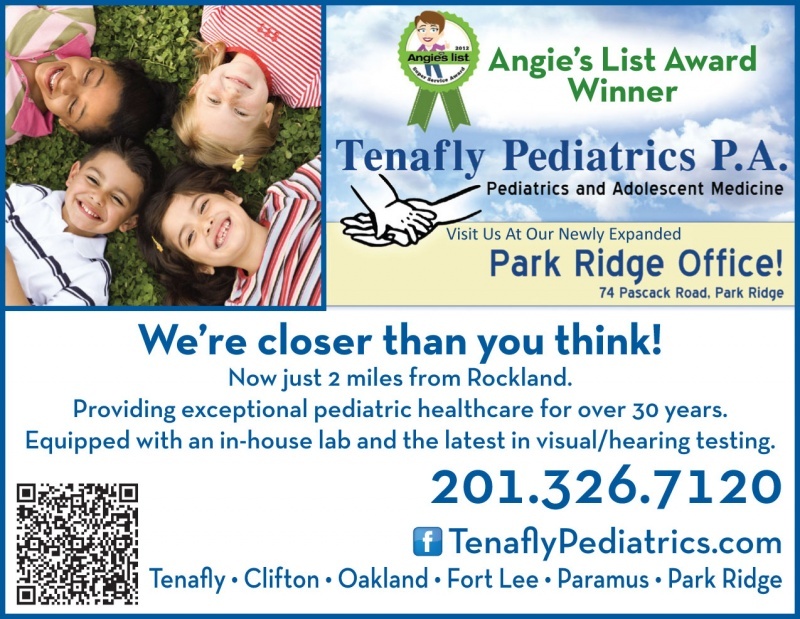 Tenafly Pediatrics is a recent Angie's List Winner with offices conveniently located throughout Bergen County.